Trans And Adopted: Exploring Teen Identity : Shots - Health News A Boston health clinic that treats transgender kids and teens finds that the percentage of its young patients who are adopted is higher than expected. These kids might need extra support, doctors say. Nathan Tasker is transgender and adopted. He was surprised and delighted to meet other adopted transgender children at his camp in Maine. "I finally, finally finally was not alone," says Nathan, a young man with dark, sparkling eyes and a wise smile. But even at this camp, Nathan expected to be different. He's transgender — and adopted. "I thought I was just a packaged deal, like, this only happens to one kid in every place in the world," he says. But then, as fellow campers told their stories, Nathan realized he was not all that different. "I was like, 'You know what? There are a lot of adopted kids who are trans.' And that's pretty amazing." Doctors at Boston Children's Hospital's Gender Management Service clinic, where Nathan is a patient, began making the same connection a few years ago. They combed through patient records and found that 8.2 percent of the 184 young people seen in the clinic between 2007 and 2015 were raised in adoptive families. Overall, only 2.3 percent of children living in Massachusetts were adopted. "Before I started seeing transgender kids, it would not have occurred to me that we might see more adopted kids," says Dr. Daniel Shumer, a pediatric endocrinologist who treated transgender kids at the GEMS clinic for three years before moving to Ann Arbor, Michigan, to work in a similar clinic. Shumer and three co-authors recently presented their adoption data at a conference and have submitted it for publication. Nathan and his doctors aren't the only members of the transgender community who've noticed this phenomenon. "People have been talking about this for a long time," says Dr. Johanna Olson-Kennedy, medical director of the Center for Transyouth Health and Development at Children's Hospital in Los Angeles, the largest such clinic in the country. Olson-Kennedy says she often hears colleagues around the country say, "we have a lot of kids who are adopted in the gender clinics." And Diane Ehrensaft, a psychologist and author of the book, Gender Born, Gender Made: Raising Healthy Gender-Nonconforming Children, says in an email, "I am seeing the same thing in my work as a gender specialist in the San Francisco Bay Area." First, it may be that there's a higher percentage of trans adopted children who get health care, rather than a higher rate of trans kids who are adopted. "Adopted people of all ages, especially children, are disproportionately represented in clinical settings," says Adam Pertman, president of the National Center on Adoption and Permanency, and author of the book Adoption Nation. "The majority of adoptions today are from foster care. Then add to those the children adopted from institutions abroad and you have a population who suffered early trauma — so of course they are disproportionately represented in clinical settings." Shumer suggests another factor when it comes to families with adopted trans children: "Perhaps parents who adopt kids are more open to differences in gender identity — may have less shame in the fact that their child may be transgender," he says, "[and] may be more likely to present to clinics for help." "When parents have biological children [who] are transgender," she says, "what happens is a blame game, like, 'Whose fault is it?' I've heard many families say, 'Well, you know, my husband has two gay cousins' or, 'My wife has a trans aunt.' "
Olson-Kennedy says adoptive parents seem to "let go of the 'this is my fault' piece." But maybe there's something else about growing up adopted — about coming to terms with that experience — that explains why transgender clinics are seeing more such children. "Adopted children who are aware of their adopted status also have an easier time being 'other' than their parents, and therefore find greater ease in being forthcoming in expressing their true gender selves," says Ehrensaft. Shumer says he wonders whether children who grow up knowing they are adopted might develop their identities in ways that make them more open to rethinking gender. "As adoptive kids are becoming teenagers," Shumer says, "they may more actively consider their gender identity in the context of their overall identity [than kids who aren't adopted]. This might help them identify that they have a gender difference more frequently than kids that aren't adopted, that aren't going through as rigorous an identity-formation thought process." Pertman says that's a new, but reasonable idea. "Identity in adoption is a complex issue," Pertman says. "I mean it's complex for everybody, but there's a whole other layer for adopted people that sort of triggers, in many of them, a deeper look within themselves about identity. And maybe this is part of what they find." Roz Keith with her son Hunter, who was adopted at birth. 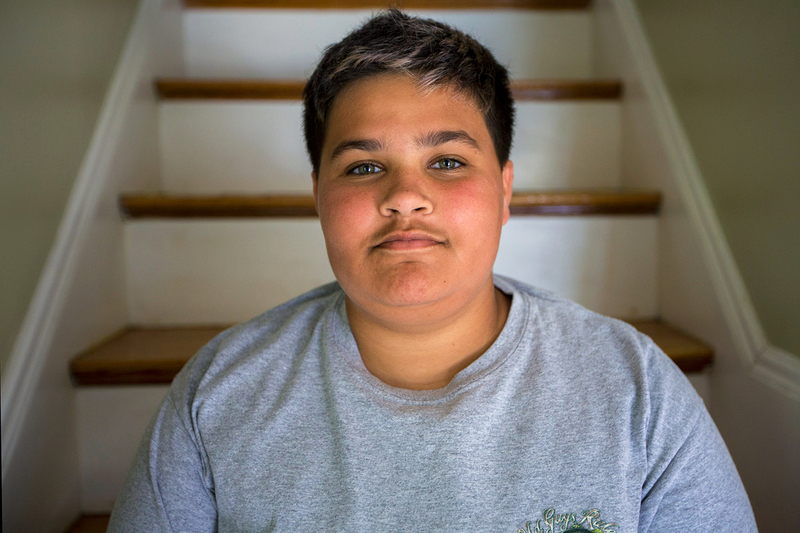 Hunter, now 17, began his transition from female to male at age 14. Maybe, but that reasoning doesn't ring true to Hunter Keith, a 17-year-old trans male who was adopted at birth – at least not in terms of his own experience. Hunter says the gender transition he started in the eighth grade did not coincide with questions about his adoption. "I've been part of my family my whole life," Hunter says. "I've never had that feeling of not belonging. It's not something I ever questioned." 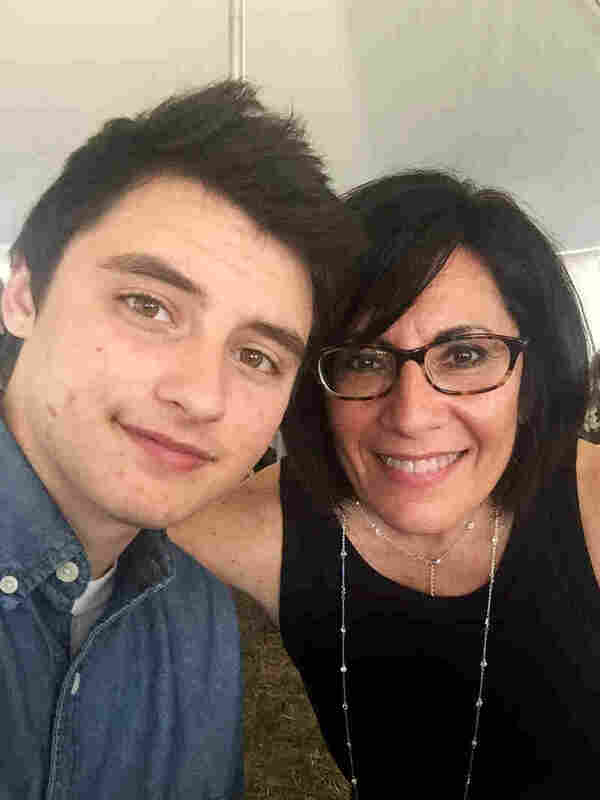 Hunter's mother Roz, who lives with Hunter and her husband and daughter in the metropolitan Detroit area, would like to see more research about the neurological roots of gender identity. She believes there may be all kinds of connections that no one understands yet. Here's one possibility Roz Keith has discussed with friends, based on studies that show greater rates of autism and learning disorders among transgender kids than among the general population: Could the kids be inheriting those conditions from their birth parents, and could those conditions be one reason the mothers place their children for adoption? "There's this incidence, then, of children who are adopted who have a genetic history coming from families where there are learning issues — ADD, ADHD," Roz Keith suggests. "It does seem that those things overlap and correspond in greater numbers [in the transgender population]." Some members of the transgender community say all these theories deserve more attention, but for now, they don't see any connection between being trans and being adopted. "I think it's a stretch, frankly," says Jamison Green, the immediate past president of the World Professional Association for Transgender Health. "People, in trying to understand what 'transness' is and how it manifests, and why some of us are this way, will elicit all kinds of conjectures." Nonetheless, Green, who is adopted, says he would like to see more research in this area. The speculation "speaks to how little we actually know," Green says. "There's much more to be learned about transness, about gender, about gender identity development in all people." With so little research, it's not clear if or how these findings should affect care for children at transgender clinics. Shumer says it may help parents contemplating adoption to learn more about gender identity as a spectrum. Doctors, nurses and counselors may want to set up support groups for adopted children, to help kids who might find such groups useful explore any and all sorts of issues as they arise. Judy Tasker, Nathan's mom, says she's sure that being transgender and adopted makes life more complicated for her son. "It's the transgender piece that throws everyone off," she says, "but, really, it's his issues from being in a poor foster home for the first 15 months of his life that really make him struggle at school, struggle with anger. The trans piece is this little piece, but it over-complicates what therapists see, what schools see, and they is fixate on it." Nathan says he's always assumed that being adopted and being trans were two separate experiences. But, "maybe somehow they're connected," he says. "Maybe adopted kids feel some dimensions that non-adopted kids can't feel, because they haven't been in that situation." This story is part of NPR's reporting partnership with NPR, WBUR and Kaiser Health News.